Liner can be removed from the laundry basket for an occasional wash. - Durable and Lightweight: the laundry hamper has been designed from natural bamboo material to be lightweight yet durable for frequent use in your bedroom, laundry room or bathroom. MINI WASHING MACHINE: The portable clothes washer has a high-powered 250-watt motor and a capacity of 7.7 lbs. Watch your clothes get clean with a translucent tub container window. Puede devolver un producto hasta por 30 días a partir de la fecha en que lo compró. The two tubs, one for washing and one for spin drying will be useful to you. The machine runs off 110v power and will take up to 11lbs capacity for washing and 6lbs capacity for spinning. I know I did. Ase Camp outdoor washing system. Water tubes are included. Exterior shows slight signs of wear. Tested and functions as intended. We promise to resolve your concerns quickly and professionally. Proceeds are used to support local programs and services. BUILT-IN drain pump and 38.2" drainage tube which allows you to easily drain out dirty water. 1XPortable mini washing machine. NOTE:It's not a fully automatic washer, you may need a little more work between washing and spinning! For small loads, and limited space the Magic Chef Compact 1.6 cu. ft. Top Load Washer is a lifesaver. Stainless steel interior tub is durable and resists rust and chipping. Portable Washers are designed for smaller loads, do not overload. Washing machine features a drain tube which allows you to easily drain out dirty water. Excellent condition. No dents or scratches. Pedestal included. Capacity:Washer: 9 lbs, Spin Cycle: 2 lbs. Power Cable Length: 5.7ft. Over all sizes: 14.17 x 14.57 x 22". Panda Portable Compact Top Load Washer, 1.6cu.ft, PAN56MGW2, Wash, Rinse, Spin and Drain Fully Automatic Washing Machine 120V. Model: PAN56MGW2. Boasting a unique, space-saving design, the Panda Compact 1. Featuring spin wash and spin dry. Our portable mini compact twin tub washing machine which is easy for you to operate. Portable Mini Washing Machine & Spin Dryer. Drain hose-After the laundry is over, you can easily hang the hose to prevent it from being stepped on the floor. Dryer Spin 9LB Portable Machines Dorm Washer Washing 8 RV Laundry Compact MINI -. Built-IN Drain Pump - Unlike our competitors, our washer features a BUILT-IN drain pump which effortlessly automatically drains water from the washer. GE Washing Machine Knob Part Number WH01X10313. Designed to fit specific General Electric manufactured washing machine models including Hotpoint and RCA. Product TypeKnob. Amana NTW4516FW 3.5 Cu. Ft. Top Load Washer - White. Condition is Used. Shipped with USPS Parcel Select Ground. Once you set the washing machine program, you could just leave it alone to work and do your own staffs. - You can stop wasting hours keeping an eye on washing machine for its full automatic cleaning mode. It has 2 large lint filters that are easy to clean. If the load ends up out of balance, the washer will detect it automatically and try to balance the load. Wash from the comfort of your own living space, whenever you want. Width 23"2.0 cu. ft. portable washer operates quietly with a noise level below 72 dBA. See-through viewing lid and stainless steel tub. 6 Fully automatic wash cycles: normal quick cotton jeans anti-wrinkle and air dry. 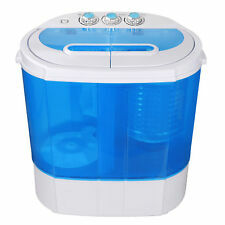 Special Quality Portable Mini Compact Twin Tub 12lb Washing Machine Washer Spin Dryer. Skip the laundromat altogether with your own portable washer and spinner. Wash laundry at your own convenience with the Portable Large Capacity Washer with Spin Cycle! Mfr Part #: CTW10V0W. Program Type: Soak Cycle. Washing Capacity: 1 ft³. Loading Type: Top Loading. Features: LED Indicator. Program Type: Normal Wash. Child Lock: Yes. Features: Lint Filter. Magic Chef. 9 Cubic-Ft Top-Load Washer MCSTCW09W1 - Sold as 1 Each. The Magic Chef 0.9 Cubic-ft. Compact Topload Washer in white is perfect for small laundry spaces. Easily customize your wash with 5 wash cycles and 3 water levels. No matter where you are in life, EcoSpin has got your back. Get the perfect duo for washing and drying your clothes. The EcoSpin portable spin dryer/washing machine is a huge money-saver. It requires no electricity to run, and it uses only a fraction of the amount of water and soap/detergent used by electric washing machines.